Enterprise Zone– provides tax incentives to facilitate the expansion of a new or existing business within the zone area. Local property tax abatement, a state income tax exemption and state income tax credits may be provided based on various factors: number of jobs created, number of enterprise zone residents employed, the number of “difficult to employ” people, zone residents needing training, the amount of investment and others. The credits are provided for each year up to 10 years. Applicants must be determined eligible by company’s SIC or NAIDS code. CDBG Action Fund Loan Program– provides a loan to certain for-profit companies that need funds for start-ups or expansion when other sources have been exhausted. Companies in non-entitlement areas apply to local government who apply to the State. Manufacturing, processing and assembly companies are eligible as long as wages are above the county average and medical benefits are provided. Funds can be used for new machinery, equipment and working capital. CBDG Loan Guarantee Program– provides gap financing for new and expanding businesses. Upon companies applying to the local government and the local government applying to the State, the State can issue loan funds for the “gap” in the financing scenario. New machinery and equipment or working capital are eligible uses. The maximum available is the lesser of $400,000 per project or $25,000 per job created or retained. CDBG Interim Financing Loan– provides short-term cash flow relief for a company. The eligible businesses are for profit manufacturing, processing and assembly companies that will have wages above the county average and provide medical benefits. An application must be provided by the locality on behalf of the local government. Amount and interest rate will be provided by the State. Term is usually 18 months and collateral is a Letter of Credit from a financial institution. 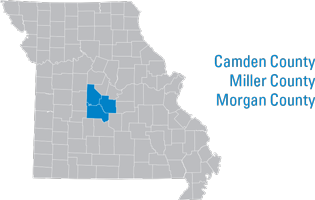 CDBG Micro-enterprise Loan– the purpose of this program is to offer grants to Missouri localities to improve local facilities, address safety and health concerns and develop a greater capacity for growth. This program is aimed at small business development by supporting a local loan fund. The fund is only available to non-entitlement funds. The maximum award is $100,000 or $15,000 per job. Project must meet one of three national objectives. CDBG Industrial Infrastructure Grant– the purpose of this program is to assist local governments develop public infrastructure that allows new businesses to locate new facilities, expand existing facilities, prevent the closing of a facility or the relocation of an existing facility outside the state. This must be a public improvement where more than one business will benefit from the project. Grant funds may be used for public streets, water or sewer lines engineering and other public facilities to support the project. A public entity must own the facility. Funding limits are determined by the number of jobs created and or retained and the private sector investment in the project. CDDG Water and Sewer Program– This program specifically addresses water and sewer needs in the state. These funds must be targeted to areas with health and safety issues. Funds are for non-entitlement areas only. Applications are accepted year round. The maximum funding limits are $500,000 or $5,000 per household. Applicants must be sure the beneficiaries are at least 51% low to moderate income persons. Work Opportunity Tax Credit– this incentive provides a financial incentive to employers that hire from 8 targeted employee groups. Any for private, for- profit business is eligible to these credits. These tax credits may be used to offset Federal income tax liability of the business and can be carried back for one year and carried forward 20 years. The credits are not saleable and transferable. There is no limit on the amount per business or total amount distributed annually. Property Tax Abatement– Chapter 353 Tax Abatement is an incentive that can be utilized by cities to encourage redevelopment of “blighted areas” by providing real property tax abatement and eminent domain. The tax abatement is available for 25 years which begins to run when the Redevelopment Corporation takes title to the property. Existing taxes are frozen on the property and the increased value of the property and its taxation is used to finance any eligible development activity. Only for-profit businesses are eligible to participate. Community College New Jobs Program– This program provides assistance to companies expanding their workforce or locating a new facility that will employ a large number of Missourians. Project funds are used to assist with the cost of training for newly created jobs. Local community colleges initially finance training through the sale of certificates. The certificates are repaid by using tax credits from the employer’s regular withholding that is based on a percentage of the gross wages paid to the employee in the new job. The tax withholding is equal 2.5% for the first 100 jobs and 1.5 % for all subsequent jobs. These funds are used to pay for the original certificates. Customized Training Program– This program provides Missouri employers with training and retraining of new and existing employees. This program is directed at providing classroom training for companies investing in Missouri facilities through either capital investments or increased workforce. These funds can be used for curriculm development, instructor salaries and training materials. Local education agencies, private vendors or company staff may provide the training. New Enterprise Creation Act– the purpose is to generate investment for new start up Missouri businesses that have not fully developed to the point where they can successfully attract conventional or specific venture capital from later stage funds. The state development department issues tax credits to 100% of the investment in a qualified fund to any accredited individual, corporation, partnership or financial institution that makes a qualified investment. A board was created to establish a qualified fund. The eligible uses of the fund are research, development and pre-commercialization to prove a concept for a new product, process or service; preproduction product development and initial marketing of a product. CAPCO (Certified Capital Company) Program– The purpose of this program is to induce private investment into certified venture capital funds that invest in new and growing Missouri businesses. Private venture capital firms apply to the state for certification as a CAPCO. CAPCOs are allocated tax credits to make equity investments in eligible Missouri businesses. CAPCO investments must be used for new capital improvements, research and development and certain working capital expenses. The maximum amount a CAPCO can invest in one business is 15% of its certified capital. MODESA (Missouri Downtown Economic Stimulus Act) this redevelopment tool will address many struggling downtowns. There are different amounts available for this program based on the population of the locality and needed investment. The taxable wage base in Missouri is $ 11,000, meaning an employer pays contributions/taxes on the first $11,000 paid to each employee. After the taxable wage base has been met, the employer continues to report the individual for the remainder of the year but is no longer required to pay taxes on those wages. The new employer contribution rate for general employers is 3.51% with the exceptions being those new employers in the construction-related industry, those employers are assigned a rate of 3.832% and employers in the mining industry receive the contribution rate of 3.567%.